Published by K12 Handhelds, Inc.
Is there a difference between having 70 dollars and having 7 million dollars? Of course. That is the importance of place value. 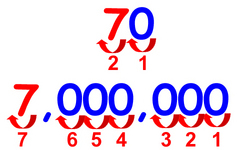 For example, in the number 70, the 7 is two places from the right. In the number 7,000,000, the 7 is seven places from the right. The first place to the right of the decimal is the ones place. The next one to the right is the tens place. The third place from the right is the hundreds place. In a whole number, the value of each place is 10 times greater than the place to the right. Places to the left have a much larger value. Let’s practice what we’ve learned. 1. Which digit is in the ones place in 547? 2. What place is the 4 in the number 547? 3. Which digit in 284 has the highest value? 4. Which digit is in the hundreds place in 178? 5. What place is the 9 in the number 879? 6. Which digit in 391 has the highest value? 7. Which digit is in the hundreds place in 953? 8. What place is the 5 in the number 850? 9. Which digit is in the tens place in 426? 10. What place is the 6 in the number 647? 11. Which digit is in the tens place in 901? 12. What place is the 3 in the number 913? 13. Which digit is in the ones place in 830? 14. What place is the 3 in the number 384? 15. Which digit in 198 has the highest value? 16. Which digit is in the hundreds place in 169? 17. Which digit is in the ones place in 983,120? 18. What place is the 4 in the number 958,564? 19. Which digit is in the ones place in 387,456? 20. What place is the 2 in the number 749,562? 21. Which digit is in the tens place in 953,420? 22. What place is the 5 in the number 361,752? 23. Which digit is in the tens place in 562,438? 24. What place is the 0 in the number 953,046? 25. 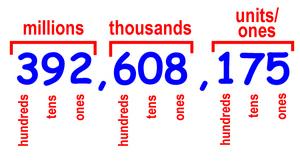 Which digit is in the hundreds place in 562,701? 26. What place is the 2 in the number 563,420? 27. Which digit is in the hundreds place in the number 867,213? 28. What place is the 8 in the number 650,918? 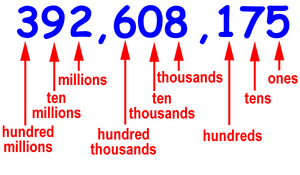 For numbers larger than 3 digits, we use commas to separate the places. 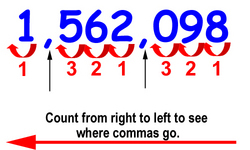 A comma should be placed every 3 places to the left of the decimal. (Make sure to count from right to left when placing commas.) Each set of three digits is called a period. To figure out where the comma goes, start counting from the decimal place or the number most to the right if there is no decimal place, after each set of three numbers, write a comma. 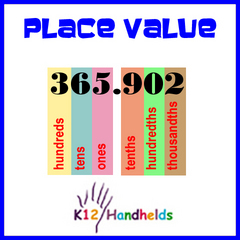 Now, let’s look at place value for larger numbers. We’ve already learned that the first place to the right is the ones place. The next one to the right is the tens place. The third place from the right is the hundreds place. The next period is called the thousands. The fourth place to the left is the thousands. The fifth place to the left is the ten thousands. The sixth place to the left is the hundred thousands. The next period is called the millions. The seventh place to the left is the millions. The eighth place to the left is the ten millions. The ninth place to the left is the hundred millions. Knowing these place names is important in knowing how to read a number. Remembering the periods will help you know how to read numbers. 29. Where do the commas go in the number? 30. How is the number “four million six hundred twenty five thousand six hundred fifteen” written? 31. How is the number 120,853 read? 32. What place is the 2 in the number 50,128,463? 33. Which digit is in the millions place in 45,187,302? 34. Where do the commas go in the number? 35. How is the number “seven hundred five thousand one hundred twelve” written? 36. How is the number 1,000,003 read? 37. What place is the 6 in the number 6,359,047? 38. Which digit is in the hundred thousands place in 16,523,804? 39. How is the number “nine million twenty six thousand one hundred seventy five” written? 40. How is the number 3,455,019 read? 41. What place is the 5 in the number 6,758,903? mcs Which digit is in the thousands place in 13,856,724? 42. Where do the commas go in the number? 43. How is the number 50,659,100 read? 44. How is the number 7,002,856 read? 45. What place is the 0 in the number 26,503,914? 46. Where do the commas go in the number? 47. What place is the 3 in the number 13,258,746? 48. How is the number “eight million six thousand four hundred eighty one” written? 49. How is the number 9,406,008 read? 50. Where do the commas go in the number? 51. What place is the 9 in the number 4,000,927? 52. Which digit is in the hundred thousands place in 42,159,367? 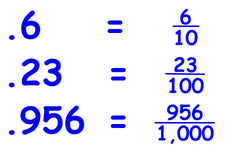 Just as there are place values in whole numbers, there are also place values to the right of the decimal point. The decimal point is a dot or period in a number that separates the whole number part of the number from the fraction part of a number. The part to the right of the decimal point shows a part of a whole number. The digits in a decimal have different place values. 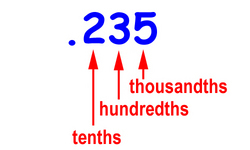 Moving to the right of the decimal point, each decimal place value is 10 times smaller than the one to the left. Remember that there is always a “th” in the name of decimal place values. No commas are included in digits to the right of the decimal point. Decimals can also be written as fractions. The digits to the right of the decimal point go on top of the fraction (without the decimal point). The place value goes on the bottom of the fraction. For example, if there is only one digit in the decimal (place value of tenths), 10 goes on the bottom of the fraction. If there are two digits in the decimal (place value of hundredths), 100 goes on the bottom of the fraction. 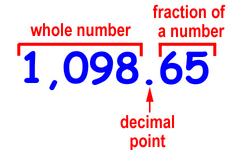 If there are three digits in the decimal (place value of thousandths), 1000 goes on the bottom of the fraction. When we count or compute amounts of money, decimals are important. The digits to the right of the decimal point are cents. The cents represent fractions of a dollar. An amount of $234.55 means 234 dollars and 55 cents. The 55 cents is a part of a dollar. Note that when stating an amount of cents, we don't write the decimal point. A dime is worth $.10 or 10 cents (not .10 cents). 53. How is the number “fifty six hundredths” written? 54. How is the number .003 read? 55. What place is the 6 in the number .567? 56. Which digit is in the tenths place in 12,679.348? 58. What is the fraction equivalent of .471? 59. How many dollars are in the amount $106.23? 60. How many cents are in the amount $6,342.08? 61. How is the number “five thousandths” written? 62. How is the number .096 read? 63. What place is the 7 in the number 905.76? 64. Which digit is in the hundredths place in 5,637.019? 66. What is the fraction equivalent of .06? 67. How many dollars are in the amount $56,231.39? 68. How many cents are in the amount $964.28? 69. What place is the 9 in the number 867.129? 70. Which digit is in the thousands place in 10,569.374? 71. What place is the 7 in the number 62,739.014? 72. Which digit is in the tenths place in 562,438.091? 73. What place is the 7 in the number 532.478? 74. Which digit is in the hundreds place in 85,379.012? 75. What place is the 3 in the number 892,157.243? 76. Which digit is in the tens place in 852,169.347? 77. What place is the 6 in the number 63,827.045? 78. Which digit is in the hundredths place in 654,739.018? 80. Which digit is in the thousands place in 45,697.023? 81. What place is the 1 in the number 91,735.64? 82. Which digit is in the thousandths place in 408,973.125? 83. What place is the 0 in the number 73,915.04? 84. Which digit is in the ones place in 439.187?